If you can dream it, we can build it. 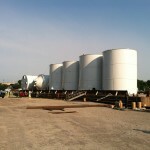 Together, we bring your vision to life by following a comprehensive process that ensures your tank or silo project is customized to fit your needs and is built to exceed your expectations. Size of tanks and silos created logistical complications to deliver by rail or truck. 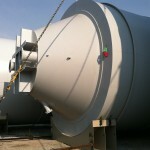 Fabricate multiple lime slurry tanks and storage silos in Cleveland, OH and deliver by tugboat and barge to Essexville, Michigan.